Belmont alumni Matt Fox, Jesse Strauss, Dillon Minacci and Alan Fey hit all the right notes as they led the efforts for the third annual Make Music Nashville festival, with the day-long music event offering performances for the first time on Belmont’s campus. Make Music Day, a global celebration that happened in more than 500 cities worldwide on June 21, 2016, aimed to get as much free outdoor music into as many corners of the community as possible on the longest day of the year. All shows were free and open to the public, and 18 venues hosted shows in Nashville for the day-long festival. Make Music Nashville involved many non-typical venues around the city, including book stores, coffee shops and storefronts, to host musicians of all genres and ability. For the first time this year, Belmont’s campus also hosted a stage outside the Curb Event Center on Belmont Blvd. with many of alumni or faculty members artists. Strauss noted that the purpose of the Make Music Nashville organization is to provide an equal opportunity for anybody and everybody who wants to perform or take part in the music-making process. In addition to artist performances, the day included a number of mass appeal events, bringing together individuals focused on one single instrument for a special performance or jam session. Strauss, whose focus instrument at Belmont was percussion, lead a drum circle in Sevier Park as well as two events at the Schermerhorn Symphony Center, the world premiere of Shimmer for cymbal orchestra and an interactive Cymbal Jungle for all ages. 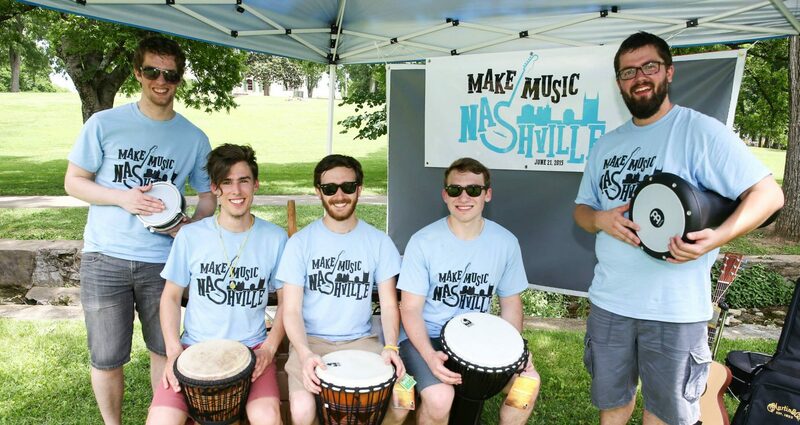 Make Music Nashville also offered free harmonica lessons at the Nashville Zoo, free guitar lessons at the Country Music Hall of Fame, a ukulele jam at Two Old Hippies and a western guitar swing jam at Gruhn Guitars, among other activities.